Wardrobe for Opportunity Community Sale! Exclusive ticket to attend Inspiration Awards 2018 - reception, dinner & admission. All contributions are tax-exempt to the extent allowed by law. Oakland Digital is a nonprofit 501(c)(3) organization: Federal Tax ID 27-0720655. We are looking for 3 more volunteers to help at Inspiration Awards on December 12! Help make an impact, sign up at http://bit.ly/ia2018volunteer. Inspiration Awards is a fundraising celebration honoring three champions bringing positive change through their passion, dedication, and innovation. It’s your chance to meet Bay Area thought leaders in the fields of technology, business, and education. 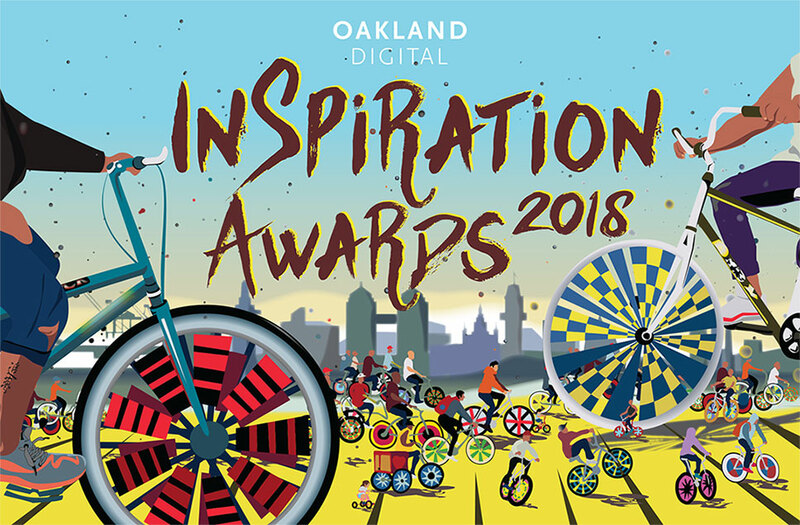 By attending Inspiration Awards, you are supporting digital literacy education to hundreds of businesses and nonprofits, jobs and opportunities to thousands of design students, and inspirational artwork throughout our community. For nine years, Oakland Digital has directly impacted the lives of 5,200 Bay Area citizens. Our core programs, Inspire Oakland and Digital Equity, have boosted the local economy by $4.8MM, leading to opportunities for 21st century employment and economic mobility. Our exciting web application BRIDGEGOOD.com has bridged the design & marketing needs for 1,000 of organizations with 4,600 talented students, creating tangible opportunity for under resourced communities. Join Oakland Digital’s ecosystem of creators, leaders, and visionaries: sponsor a table, purchase an advertisement, or make an in-kind donation. Call (510) 435-2945 to get involved. Myesha Brown is a proven Brand Marketing and Project Manager who has expertise in building and nurturing relationships that lead to strong partnerships. As a Marketing Manager, she has managed partnerships with community-based organizations such as Silicon Valley Community Foundation, Peninsula Conflict Resolution Center (PCRC), San Mateo County, and over thirty local organizations. Myesha’s efforts have resulted in co-marketing Anti-Bullying Campaign with State Farm Insurance to decrease bullying in the Jefferson High School District. And lastly, Myesha has planned events for thousands of fans at professional sporting events for the Golden State Warriors, the San Jose Earthquakes, and the Oakland Raiders. The Warriors support organizations around the Bay Area that close gaps of opportunity and access for underserved students. In 2016, the GSW Foundation provided significant support to help Oakland Digital launch BRIDGEGOOD, now providing opportunity to 5,000+ emerging designers, artists, and multimedia students. Claudia Burgos serves as the Director of Legislative Affairs and Community Relations at AC Transit. In her role, Claudia is responsible for AC Transit’s relationships and partnerships with stakeholders in AC Transit’s 364-square mile service area. She serves as an integral member of the AC Transit team ensuring the District has support to advance all programs, projects, and initiatives. With a service area population of 1.5 million, annual ridership of over 52 million, and over 171,000 daily riders – AC Transit plays a critical role in the Bay Area transportation network and the Bay Area economy. Prior to joining AC Transit, Claudia served the residents of Oakland over a ten-year period while serving as Chief of Staff to Ignacio De La Fuente, Noel Gallo, and former Mayor Jean Quan. Claudia graduated from UC Berkeley with Bachelor’s degrees in Legal Studies & Social Welfare. Earlier this year, Claudia was named one of Mass Transit Magazine’s Top 40 Under 40. Claudia’s serves on the board of directors of The Unity Council and the De La Fuente Scholarship Foundation and lives in Oakland with her husband and three children. Dr. Tammeil Gilkerson is the president of Laney College in Oakland, California. Prior to her current role, she served as vice president of academic and student affairs at Contra Costa College and as the first diversity, inclusion, and innovation officer for the Contra Costa Community College District. Tammeil has also served as the vice president of academic affairs at San José City College and dean of counseling and matriculation at Evergreen Valley College. Tammeil began her community college career as a faculty member in psychology counseling at Chabot College, serving as the coordinator for the TRIO Student Support Services program. She served as the Academy and Education Policy Director at The Greenlining Institute and in positions at UC Berkeley in the Office of Student Life and the Early Academic Outreach Program. Dr. Gilkerson holds a bachelor’s degree in history, a master’s degree in counseling with an emphasis in marriage and family therapy and pupil personnel services, and a doctorate in educational leadership. Melissa Colorado joined NBC Bay Area as a reporter in April of 2018. Colorado mainly covers the East Bay in the afternoon editions of “NBC Bay Area News” which air Monday to Sunday at 5 PM, 6 PM and 11PM. In addition, Colorado also reports for NBC Bay Area’s sister station, Telemundo 48 Area de La Bahia / KSTS, as well as for the stations’ digital platforms. Colorado joined KNTV after working as a morning reporter at KARE-TV in Minneapolis, Minnesota where she covered a number of high profile stories including Super Bowl LII, the officer-involved shooting of Philando Castile and several other high-profile stories. Before this, she worked in Albuquerque, New Mexico at KOAT-TV as a general assignment reporter. Colorado was born and raised in New York City and earned a bachelor’s degree in Broadcast Journalism from Brooklyn College. She is delighted to call Oakland home. You’ll find Melissa on weekends running around Lake Merritt with her dog, Sota. As a lifelong volunteer, Mayor Libby Schaaf has over two decades of public service experience that began while she was a young attorney and co-founded the non-profit Oakland Cares, which organized and implemented hundreds of volunteer community improvement projects across the city. She later left her legal career at Oakland’s largest law firm to build and run the first centralized volunteer program for Oakland public schools at the Marcus Foster Institute. Mayor Schaaf is honored to serve the people of Oakland and to help promote her hometown as the greatest place to live, work, play and do business. She is committed to revitalization that preserves and celebrates Oakland’s diversity and leads to direct prosperity for long-time residents and newcomers. Her four areas of focus as mayor are: holistic community safety, responsive trustworthy government, sustainable vibrant infrastructure and equitable jobs and housing. She is dedicated to ensuring the safety, education and fair treatment of all Oakland residents. Shaun Tai is the Executive Director of Oakland Digital, an award-winning design studio dedicated to enhancing tech literacy and opportunity among Entrepreneurs and Student Designers. Shaun also leads the direction and product strategy for BRIDGEGOOD, a web application that connects overlooked talent to professional opportunities. The platform is supported by Google.org and the Golden State Warriors. Shaun received an MA in Architectural & Urban Design and a BS in Advertising from San Jose State University. Prior to SJSU, he graduated with honors from Cal State East Bay with a BA in Digital Arts and was named “Distinguished Young Alumnus” of the academic year 2015. In September 2016, Diablo Magazine ranked Shaun #6 in their prestigious 40 Under 40 campaign. In March 2017, SF Business Times named Shaun 40 Under 40 alongside the Bay Area’s brightest CEOs and Directors. In April, Cal State East Bay recognized Shaun as a 40 Under 40 “Civic Service & Activism” Recipient, Class of 2017. Currently Shaun is leading a $6MM capital campaign for BRIDGEGOOD Design Studio to ignite job creation and community growth among design students, nonprofits, and small businesses. Selena Soberal is a creative and businesswoman that is driven and passionate about using her talents wisely. In 2018, she released an EP “Taking Care” on SoundCloud. Selena is on releasing more music so that she can tour, and within the next 10 years, become the owner of a music venue. Growing up with a musical family, Selena was surrounded by the music of Motown, Oldies, R&B, Funk, Salsa, and Pop. As she got older Selena picked up the saxophone, which brought the huge influence of jazz into her music. Vocal jazz brought Selena into the world of A Cappella, challenging her to new lengths vocally. As a female entrepreneur, Selena dreams of touring and making an impact through music, art, and its perceived boundaries. Her ultimate goal: creating a space that fosters creativity, empathy, and innovation for the community surrounding it — a vision that Oakland Digital wholeheartedly supports. We look forward to celebrating leadership and inspiration with you! Oakland Digital is an award-winning 501(c)(3) design studio for good, giving overlooked Creatives the resources to discover and explore meaningful careers (e.g., UX, UI, Visual Design) while improving diverse local economies. Since 2009, Oakland Digital has directly impacted the lives of 5,200 East Bay citizens. Our core programs, Inspire Oakland and Digital Equity, have boosted the local economy by $4.8MM, leading to opportunities for 21st century employment and economic mobility. Our exciting web application BRIDGEGOOD has bridged the design & marketing needs of 1,000 business owners with 4,500 talented creatives, creating tangible opportunity for everyone.